Few other foods could have inspired songs, books, and movies, but there’s just something about chocolate. Milk, dark, or white. Truffle, bark, or bar. Chocolate is both artful and delicious and a top choice with consumers. According to Mintel, chocolate sales are up 2.4% and are forecasted to rise another 14% between 2017 and 2022. 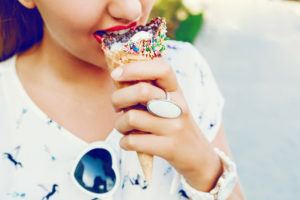 Additionally, 49% of chocolate-buyers would like to see more bite-sized options, which falls right in line with the snacking culture that sees more and more consumers eating between emails and meals. How can your confections create a commotion among consumers? Hot and cold. Yin and yang. Sweet and…spicy? While a simple milk chocolate bar can be simply delightful, consumers are demanding more unique textures and flavor combinations, and unexpected spice is on the rise. Spicy candy sales were up 16% in 2017, according to CandyStore.com. And with Snickers Fiery with hot pepper nougat hitting the scene, the craze is spreading to chocolate as well. Take advantage of this hot trend by adding some heat to your creations. Try a spicy Mexican chocolate truffle covered in a praline pistachio grind and an extra sprinkling of cinnamon. Or for something even more daring, try a chipotle chili truffle with sea salt toffee and a dash of habanero chili powder. Spice is nice, but it’s not the only quality that’s hot with consumers. Millennial snackers are adventurous eaters, and they seek experiences from their food. This leads to a rise in exotic and ethnic flavor profiles entering store aisles and restaurants. A bar of chocolate is more reasonable than an international plane ticket, and sampling these complex, foreign ingredients lets foodies explore new cultures and locales without leaving town. Savoring a bite of exotic truffle from a restaurant booth or a living room couch can transport a person to China, India, or the Mediterranean. Try a truffle flavored with matcha and coated in fortune cookie grind. Or take advantage of the subtle sweetness of curry by adding the spice to a dark chocolate truffle and top with toasted coconut flakes for treats with Asian flair. Or for something delicate, try a dark chocolate bark with saffron and cardamom, topped with shortbread cookie crumbles. 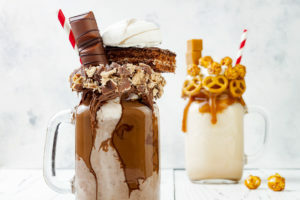 Part of the drive for consumers seeking more bite-sized chocolate options comes from an overarching movement of reducing sugar intake. Many consumers find it more acceptable to indulge in chocolate treats when it’s just a taste. An espresso flavored dark chocolate truffle topped with mint flakes would make for a perfect after dinner bite. Or bring savory, umami flavors to your confections by adding some roasted, toasted, or smoked toppings. Like milk chocolate bark topped with praline pumpkin seeds. Or a milk chocolate truffle filled with salted caramel and covered in a pretzel grind. We are confectioners, so we understand your needs to add intrigue to your products and keep customers coming back for more. Reach out to us today for collaboration on your next confection creation.